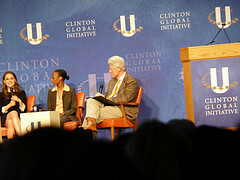 Once again, more than 1,200 movers and shakers have convened for the Clinton Global Initiative, designed by the former president to engage philanthropists, corporate leaders and heads of state – gathered in New York for the UN General Assembly - in substantial commitments to address some of the world’s most challenging issues. While President Obama grapples with the thorny problems of the Middle East across town at the UN, the CGI attendees are enjoying the opportunity to talk about positive developments in countries around the globe. The last topic, generating jobs in a difficult economy, was the focus of the first CGI America conference, which convened in Chicago this past June. One outcome of that conference, announced at yesterday’s sessions, was the progress generated by applying Toyota’s production system expertise to the rebuilding effort in St. Bernard Parish, La. The St. Bernard Project (SBP) is a nonprofit rebuilding organization working to replace or rebuild houses in the Greater New Orleans area, in the wake of Hurricane Katrina. SBP also creates jobs for veterans in skilled construction, and operates the country’s second VeteransCorps program. For those recovering from disasters, time matters. There’s a massive human impact from efficiency and the partnership with Toyota is going to make a significant difference in families’ lives. Injecting corporate expertise, along with dollars, into a not-for-profit effort on a much greater scale was announced by Dow Corning, which committed $5 million to the Global Alliance for Clean Cookstoves. Beyond the cash contribution, CEO Bob Hansen explained, Dow Corning will embed employees to add “technology, business, and innovation expertise” to help the Alliance improve the quality of stoves and lower the cost of production to make safe stoves more affordable to poor families in developing countries. The Alliance estimates that millions of deaths each year, as well as widespread sickness and injuries, could be prevented by reducing the irlsexposure to toxic smoke emitted by traditional cookstoves. Improved stoves will not only reduce a major source of carbon emissions – estimated at over 20 percent of what’s polluting the atmosphere – they will also free up time for women and girls to devote to education and income generating activities, instead of fuel gathering. The grant, which builds on previous investments in women’s economic opportunities by ExxonMobil and its Foundation, will support a research study in Nigeria, the United Arab Emirates and Indonesia aimed at identifying specific mobile services that can help women entrepreneurs enhance their businesses, as well as barriers which may hinder access to those services. These commitments are typical of the multi-sided partnerships that have set a high bar for goals and performance since CGI was created in 2005. Through last year, they represented more than $63 billion. CGI estimates these more than 2,000 commitments have improved the lives of some 300 million people in more than 180 countries. When CGI 2011 wraps up tomorrow afternoon, those numbers will clearly grow. Hopefully, additional successful models will be developed, and the contributions of individual philanthropists, foundations, corporations and governments will be injected in increasingly innovative ways.